April may be the cruelest month, but August 2018 is giving it strong competition. On August 20, Israel Minister of Public Security Gilad Erdan (Likud) approved new, less stringent criteria for licensing civilians to keep and carry guns. The reason behind the decision: to allow on-the-spot reaction to Palestinian acts of terror within Israel. The new criteria will allow an estimated 600,000 more persons to own and carry weapons. The new “civilians against terror” are to include persons who served in IDF combat units, past IDF officers and NCOs, police personnel and police volunteers. It was estimated that prior to the new regulations, approximately 150,000 civilians were licensed to carry guns. Unlike the United States, where the right to bear arms is considered an individual right, in Israel, up to now, guns were mainly the prerogative of persons actively serving in the IDF or residing in the occupied territories. Their presence, at least in the hands of soldiers, is quite obvious to all. Now, in order to enable civilians “to help fight terrorism,” that right has been extended. Progressives in the United States view the proliferation of guns as one of the causes of their usage for purposes that have nothing to do with defense. It is no secret that it is also a cause of serious accidents, not to mention murders and homicides, on the part of minors who get hold of those guns unbeknown to their parents. While progressive Americans fight for gun limitations, the very government of Israel is now facilitating gun proliferation. This change has, of course, a gender dimension: most of the new carriers will be men; many of the innocent victims will be the women married to or in relationships with them. 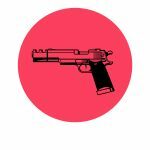 The new regulations concerning gun possession are but another consequence of the occupation of Palestinian territories and the lack of political will on the part of Israel’s political leaders to negotiate a political settlement to the conflict. The lives saved by having more people tote more guns will be negligible compared to the innocent civilians killed by indiscriminate firing as well as shootings in moments of anger. The idea of putting guns in the hands of more Israelis will most likely result in more, rather than fewer, Israelis being killed. What is needed is not to arm over half a million more Israeli men so that they can fight off Palestinians who violently protest the occupation, but rather to work for a negotiated political settlement of the conflict. Barbara Swirski | The Occupation: Who Pays the Price?